Once considered to be the largest school of its kind in the British Empire, it is designed in a Collegiate Gothic architectural style. Many early 20th-century Canadian schools were built in this style. While construction was funded entirely by the local municipal government, in 1913, Prime Minister Sir Robert Borden saw it was in his best interest to lay the first cornerstone. The important Montreal architectural firm Ross and Macfarlane (later Ross and MacDonald) won the design competition for the school (the firm is noteworthy for designing Toronto’s Maple Leaf Gardens among many other buildings). As Rebecca Sisler stated in her book, Art for Enlightenment: a History of Art in Toronto Schools, the artists who came here were among the “legion of department graduates who became ranking artists in Toronto, and who were to make national names for themselves in all artistic disciplines….” Library and Archives Canada has many of these artists’ private archival collections. The school also boasts as its alumni, the colourful businessman Edwin “Honest Ed” Mirvish and the renowned physicist Leon Katz. The school (which was considered for a heritage designation by the City of Toronto in 2014) has many medieval-inspired features, and is an extended rectangular-shaped three-storey plan with stone walls that are faced with a combination of pink and grey limestone, and trimmed with stone and terra cotta. The west facade features a square tower that has buttresses, balustrades, decorative stonework, and narrow lancet windows. The main entrance is also spectacular—a stone archway supported on buttresses with grotesque sculptures symbolizing “industry” and “science,” a set of three oak-panelled doors, and a stone crest that includes the coat of arms of the City of Toronto. 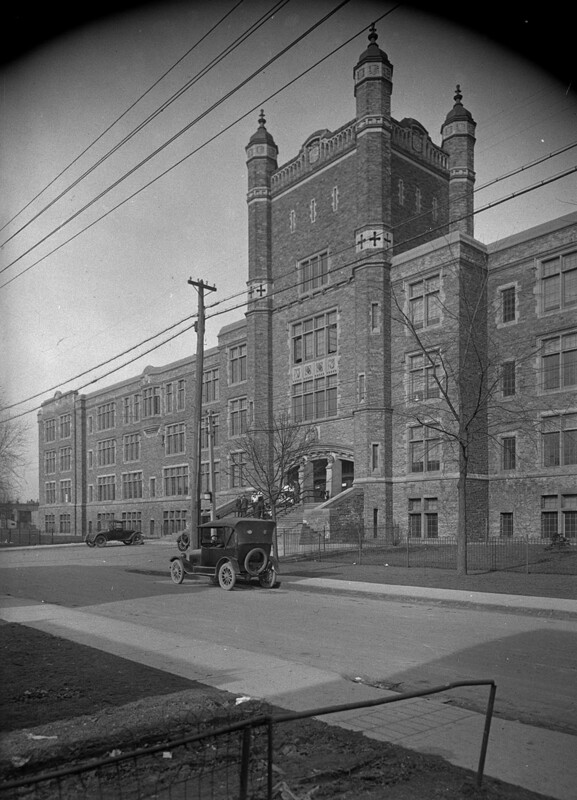 The Toronto School District documented the construction of the school. The building is a striking expression of Canadian society’s belief in learning in the early 20th century. Dr. Alexander Charles Mckay, Director of the Toronto Board of Education from 1911 to 1926, was partly responsible for this. 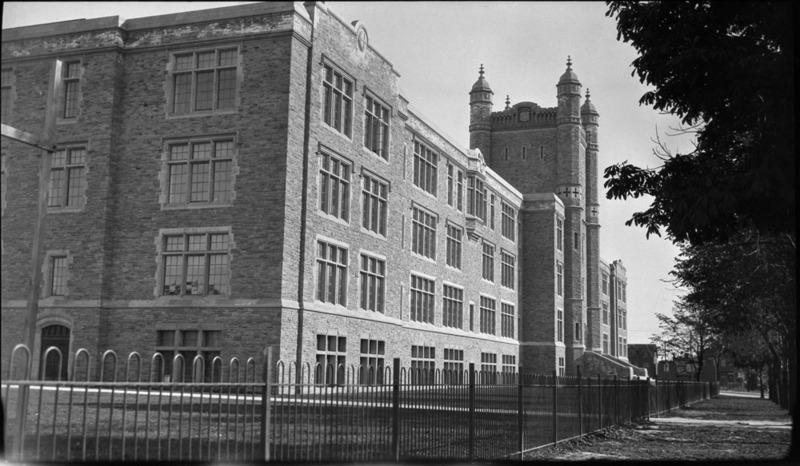 While he wanted a Canadian school that would support the instruction of skilled workers in various technical industries, McKay also believed that a beautiful building was conducive to the soul of learning. So before the school was constructed, Mackay conducted a tour of European polytechnical schools to look at good designs. And certainly a century later, the imposing Central Technical School still works; it is a grand and uplifting place which has aged gracefully, and now harbours an aura of old-world tradition and excellence. Happy birthday Central Technical School! 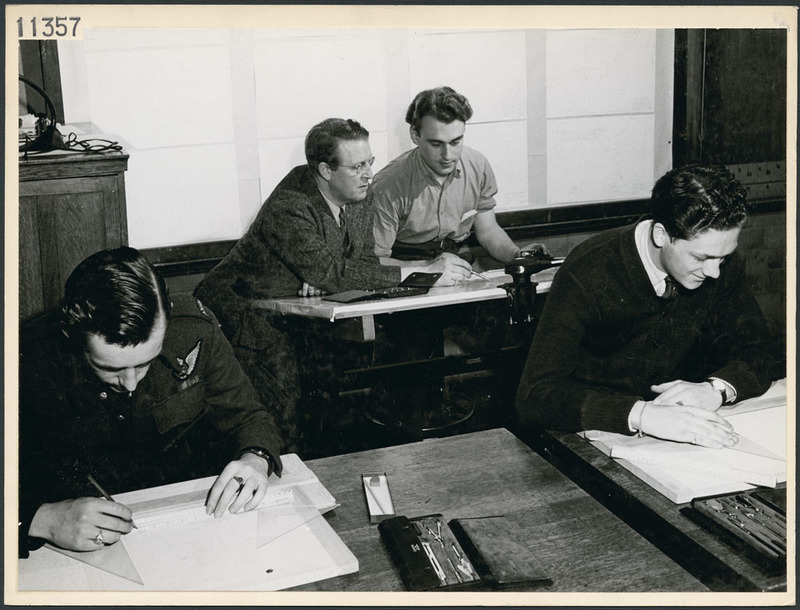 This entry was posted in Our Collection and Facilities and tagged architecture, Central Technical School, Education, Toronto by Library and Archives Canada Blog. Bookmark the permalink. Regarding Doris McCarthy, your post links erroneously to a completely different person with a similar name. For the archives of Doris McCarthy the artist, see https://www.utsc.utoronto.ca/~dmg/html/collection/research.html.